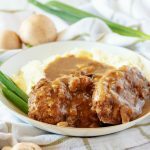 Instant Pot Salisbury Steak is the perfect comfort meal made in a flash! Delicious meaty patties are covered in a hearty mushroom gravy, then served over your choice of fluffy mashed potatoes or rice. This is one meal that will bring the whole family to the table! In a food processor, add 6oz Baby Bella mushrooms and pulse until minced. Remove and set aside. Add all steak patty ingredients beside beef and blend until everything is well combined. Add mushrooms and beef and pulse until everything is combined. Remove beef mixture from bowl and shape into 6 flat patties. Dredge patties in the two tablespoons of corn starch, Make sure to shake off any excess. Turn Instant Pot onto sauté. When Instant Pot is hot, add two table spoons of butter. In batches, place patties into cooking pot, brown on both sides and remove to a plate. Cook only 1-2 at a time to avoid breaking patties when removing from the Instant Pot. Add the rest of the butter, mushrooms, onions, and minced garlic, and cook 2-3 minutes, until onions are fragrant. Add the red wine and deglaze the Instant Pot. Turn Instant Pot off and pour gravy mixture in. Then, give everything a good stir. Carefully place beef patties into the instant pot. Close Instant Pot and set to sealing position. Select manual high pressure (the manual button or the pressure cook button on the newer models) and set timer for 10 minutes. When timer is up, perform a quick release of pressure. Remove patties and turn Instant Pot off. Turn Instant Pot back onto sauté. Remove one cup of broth from the pot and mix with 2 tablespoons of cornstarch. Add slurry back to pot and simmer for 3-4 minutes until gravy is thickened. Serve patties over mashed potatoes and enjoy! if you want to make your mashed potatoes in the instant pot at the same time, add a tall legged trivet and place a steamer pan on top with cubed potatoes. You will then just cook everything by following the above directions.